Pick a spot on the pristine garden, overlooking the magnificent dam or in front of the elegant Cape Dutch Manor House, finding shade among the large oak trees and watch the sun set behind the Stellenbosch Mountains. Guests may also receive a friendly visit from the ducks who waddle and swim around the dam. 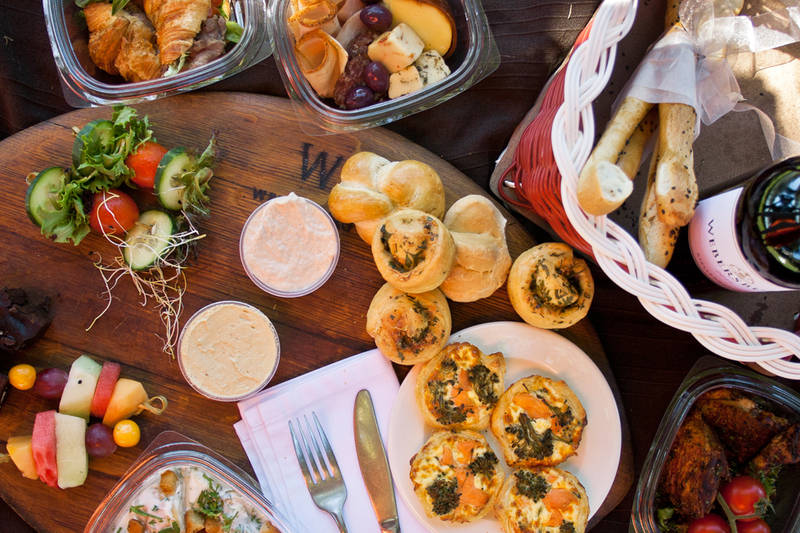 Home baked breads & breadsticks with jars of hummus and smoked snoek pâté. Portuguese style roasted chicken pieces with lemon, paprika and parsley. Croissant filled with slow roasted beef brisket, grilled tomatoes and fresh basil. Salmon & broccoli baked quiche with fresh chives. Cheese and pesto scone rolls. Baby potato salad tossed with Greek yogurt, fresh herbs and croutons. Selection of local cheese & charcuterie platter. Packets of home baked shortbread.